Home » Easter » Why Not Buy A Rabbit For Easter? With Easter so close it’s important to realize that rabbits do not make good “starter” pets for children. This common misunderstanding of rabbits as easy pets leads to many impulse purchases of bunnies during Easter time followed by the surrender of many bunnies to animal shelters shortly after Easter. • Rabbits are not “low-maintenance” pets — they need as much care and attention as dogs and cats. • Most children lose interest in a live bunny after only a few weeks. • Rabbits need regular veterinary care by a vet with additional training in exotics. • Rabbits have an average lifespan of 8-14 years. • Rabbits must have an adult as their primary caregiver. • Rabbits are the third most frequently surrendered animal at shelters, and the third most euthanized. • According to an ASPCA study, rabbits are more expensive to own than cats or guinea pigs — coming just after dogs in expense. 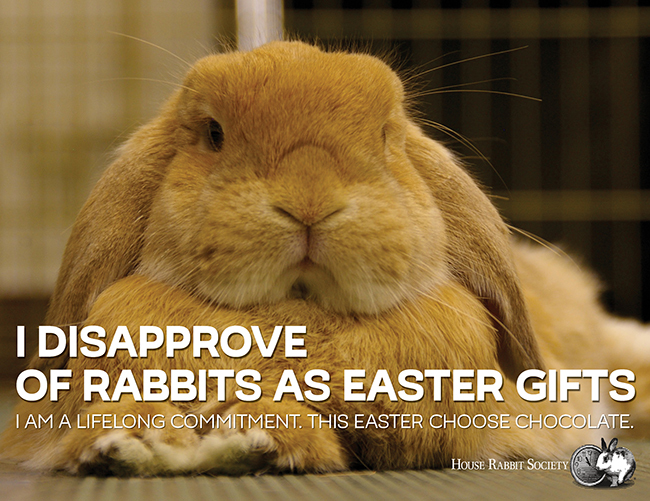 This Easter, don’t buy or adopt a bunny on impulse. Alternatives to live animals — such as plush bunnies, chocolate bunnies or books about bunnies — make great gift choices and come with no additional obligations or responsibilities.